It was a brisk but beautifully clear morning for this year's Gunner Shaw memorial Race put on by the Lion's Gate Road Runners. I wasn't sure if I would be able to get away from work on a busy Saturday for this one, but my boss was kind enough to give me until 12:30 to get there so I didn't miss out on the last race of the year. I wasn't able to run enough of these races to qualify for series points, but at least I could show up and run to get my team some points for the series team trophy. I expected this race to be fairly low key just like most of the other cross country races. 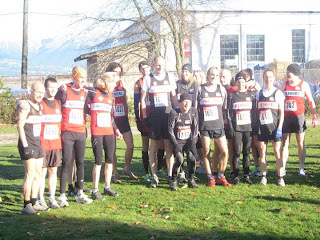 When I arrived I noticed several elite runners who had all had very good seasons. Among those present were several very talented runners from the Hershey Harriers including Jason Loutit, Sean Chester, Herb Phillips, and non team member and running shoe guru from Forerunners Jerry Ziak. 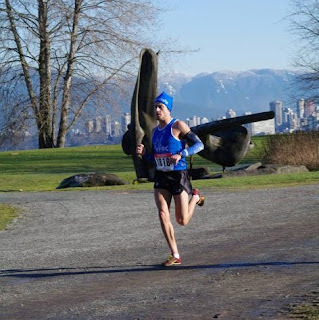 There was also this fellow who recently hit the scene from Point Grey named Ben Thistlewood who has been tearing up the cross country circuit and beat me at the Remembrance Day race. I was wondering about shoe selection and had brought my spikes with the intention of wearing them during the race. I was a little sceptical of wearing my spikes for ten km as I wasn't sure of how much pavement or hard pack gravel areas we would have to run on because it was my first time on this course. I considered wearing the New Balance 101's that I had just got as Drew was wearing them. After some quick advice on the course from Gramps, I was sure that the spikes were certainly going to be the best bet for this mud fest. Grampa and I had been out here a few weeks earlier for a prep tempo for his National Cross Country Championships in Guelph Ontario. It was muddy and slippery that day and not much had changed in the way of how mucky it was. The organizers for this event usually have the runners run through a water section with water up to their knees, but it was frozen this year so they had to alter the course slightly. There was also a section where you had to run along Jerico Beach in fairly deep, loose sand. 200 people lined up and prepared for the command to start the race. I was not feeling overly great due to the fact I was up late the night before watching a friends band play. That also included greasy chicken wings and draft beer. A sure recipe for stomach issues. I was able to rid myself of all the evils from the night before being it that the race didn't start until 11am, but still wasn't feeling race ready. I certainly didn't plan on having to race the big guns who showed up today. Its always good to try and get the whole shot in a race like this or else you have the potential of bottle necking in the corners. I wanted to get a good position, but knew that I wasn't going to win this race and that I could relax slightly during the first lap of this race. This was a 10km race which consisted of two 5km loops around the same loop. Out of the start, I felt comfortable and could see Drew charging ahead with the leaders. I knew that he was going out too fast and settled into somewhere around 10th position through the first skinny section. We were running on grass for the first part of the loop and my traction was solid and the feeling was very soft underfoot. As we curved back in towards the beach, we encountered some deep sand pockets which were very difficult to plough through. After that we were running out on the beach in front of the Jerico Sailing Club. At this point I could hear the crowds cheering for me and Jason. I couldn't believe I was holding the lead on him even at around the 1 km mark. I was wondering if I was going out too fast, but felt so comfortable so I kept going. When we hit the beach it was a sense of panic and chaos trying to get any grip at all. It felt like I was on a treadmill on full speed. I could see runners going high and low in search of proper footing along this labouringly loose sand. I could see how the waves had left a ridge on the sand which at this time of day was casting a shadow on a skinny rim of sand going along the course. In the shadow the sand was frozen and hard! I kept my feet reaching for the frozen sections hoping that no one would catch on. I was gaining ground on the runner ahead and saving energy at the same time as we plodded along the beach. We turned right towards the park exit and hopped over the logs to get off the beach. It was now time for some more mucky grass and leaf covered mud. We ran slightly uphill and had to jump a muddy stream which was very hard to get all the way over, so we inevitably had to put one foot right into it. Up the grassy hill to west 4th Avenue and around back towards the park for some technical hilly sections. I was loving the traction I was getting out of my spikes and the freedom of being able to pick different lines through the mud or sand to optimize my foot hold. There was a very steep section of downhill with long grass where Kevin and some other team mates were cheering and I really enjoyed going as fast as I could down the hill in front of them and then taking off down the straight. I guess I wasn't feeling so bad after all. I caught up to Drew and passed him on the next steep up hill. I enjoy passing people on hills because I know it hurts them even more. I know, I know, Why would I be so mean to my team mate? Well we are all friends at training and after the race, but when the clock is ticking, it's every man for himself. I really wasn't deviating from my plan, just was feeling really good. I passed through half way in 17:00 flat. "Not bad for this course." I thought to myself, as I dug in and focused on the runners ahead of me. We hit the beach for the second time and this time the sun had melted all of my frozen sand and it had become very soft and torn up by all the runners. There were logs and frozen shadows along the way to get a few good grips, but most of it was power sucking sand steps. I tried to be light on my feet and increase my cadence which seemed to work on closing the gap. I was by myself now from what I could (or couldn't) hear behind me and there were two runners which I was slowly closing the gap on. I could tell the sand was wearing them out as it was me but I refused to let it slow me down. As we cornered to get off the beach I was right behind them now. I leaped into the footprints being left by the runner ahead of me which seemed to help decrease my resistance. When we finally reached the grass, I made my move. I knew that there was a slight hill ahead but I wanted to get ahead of these guys before the stream, in case of any carnage. I could tell they would not be an issue as I passed them because I was still feeling pretty good and was still quite excited to be running through such extreme terrain. 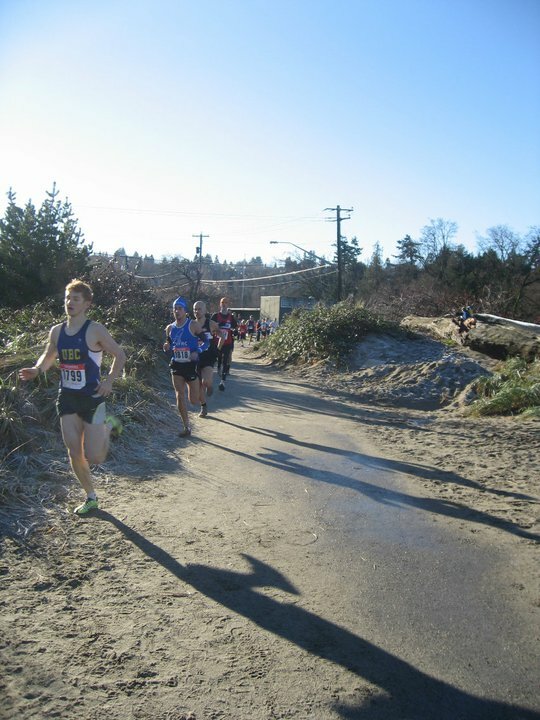 I must take my hat off to the Lions Gate Road Runners for laying out such a fun and challenging course. What a blast I was having! Despite the pain, I could hardly wipe the grin (or grimace) off my face. Up ahead, I could see a tall runner with longer curly hair who I recognized to be a talented member of the Harriers. A solid competitor, but I locked my sights on him and began to reel in the string between us. I made my move to pass him on one of the last steep up hills. I pushed hard on top of the hill to keep the pressure on but could feel him push close once again. We careened down a steep hill and rounded the bend over a bridge. I maintained my lead on him until we got to another little grassy hill. He passed me going up this hill. I could hear and see Kevin saying "Remember the Beavers!!" As I pushed over the hill and he scolded me. "Don't let him get away!!" It was now time for my final move if I was going to make one as we were within 1km of the finish now. We entered a very muddy and puddly technical section which I knew I could make up some ground on Sean again. As we turned to get out and over the low section, the hill made my tiring legs stumble and the ground in which I had just gained was taken away in that instant. I could see him making his push for the finish as we had only 400 meters to go. I maintained the 15 meter gap between him and I as we sprinted for the finish. I knew this was a race for third place but just didn't have the proper rest and nutrients to pull it off in the final moments of this race. A very strong effort and performance crossing the line in 33:45 for 4th place overall and 2nd in my age group. I was very impressed with the way I ended up among these fierce competitors and had a very good time out on course. The following two days made me smile every time I thought about blasting through that park and I can hardly wait for my legs to recover so I can do it again! VFAC wrapped up the cross country season by winning the team event in the series, but were unfortunately beaten in this race by the Harriers. Only by 36 points though. I look forward to some good quality skate ski sessions and some excellent leisurely runs on a lax schedule for the next couple of months. I also have to make some serious decisions about how to race the best races for my running career in 2011. I will make sure to fully strengthen all of my key areas on my time off at the gym and look forward to even swimming some laps at the local pools now that I have my three month pass. It's been a busy and productive season and I'm already looking forward to the fruits of things to come. Stay tuned and stay healthy runners! There's plenty more life out there to live, let's go get it. Things I hate: Not being able to partake in the free pizza and awards after the race. Things I love: Splashing through the mud on the trails.